Owners of long hair – a really happy girl. Due to the long locks these girls can make numerous hairstyles, which are suitable for all occasions. In this lesson we will look not quite popular, but beautiful hair “Bow hair”. Her cooking takes little time, and the result is quite impressive. With this hairstyle can be displayed on a secular party, go for a walk or even a job. Home is best to go with her hair, to give them a little rest. Our lesson is accompanied by a photo-instructions, which will help you to learn a new hairstyle. Any questions can be asked in the comments below the article. Overall hairstyle looks very elegant, but at the same time cute. Suitable for girls of all ages. It can do as ordinary schoolgirls, and old ladies. Having studied this workshop, you will need only a few minutes, to bring such beauty on the head. 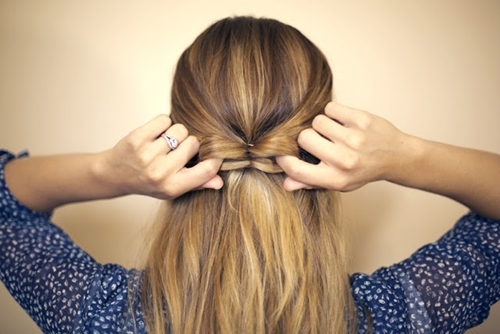 Plus, this hairstyle is, that its preparation takes really little time. 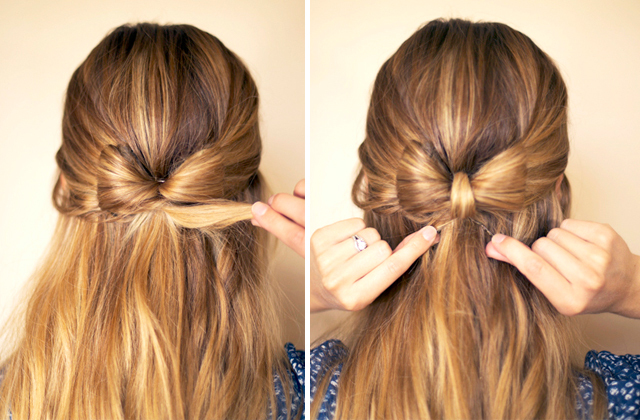 If you do not want to go to the store with disheveled hair, you just have to go and bow braid. 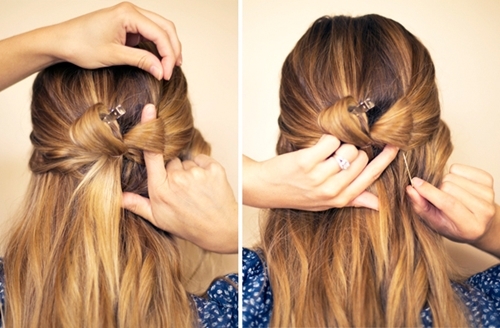 This hairstyle is best done on long hair, but suitable hair and medium length. Unfortunately, with short hair is impossible to carry out this procedure, but specifically written for you this article, where you will be able to pick out something for the soul. The first thing you need to prepare your hair, To do this, wash your hair thoroughly and blow dry, then comb. If your hair is naughty by nature, then use utjuzhkom, otherwise the result may be poor. 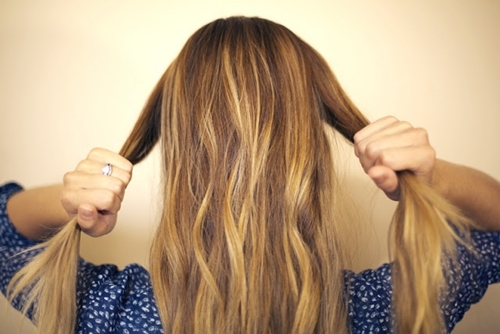 Next, you need to separate the two strands of hair on both sides, as shown in the picture. Calculate the size of the strands, they are more than, the larger will he bow. Should not be exaggerated, otherwise bow will be too large, and hairstyle will look awkward. The second step is necessary to connect the two strands into one so, To get the tail. At the last turn of the need to make a small loop. Focus on the image below. Using the index finger, Divide the loop into two parts. Now fix one of the hairpin loops, it will have to work a little later. The remaining spin loop must thus, that it took the form of a flat bow. Next, the resulting quench bow top and bottom of the Invisibles. Do this procedure with the remaining part. The work is almost finished. It remains to disguise gum. To do this, wrap a bow around, the remaining tail ends. To consolidate again use stealth. 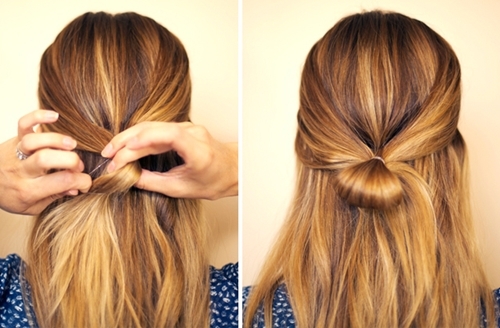 Now you know, how to make a bow made of hair and hairstyle can use it in any occasion. Do not forget to share knowledge with their friends.